For the crust, place the butter in the bowl of a stand mixer. Blend on high for 1 minute or until light in color. Add in the sugar, egg and vanilla and blend on medium speed until well combined. Scrape sides of bowl as needed. Slowly blend in flour, salt, baking soda, cinnamon and nutmeg. Cover the bowl with plastic wrap and refrigerate for 30 minutes. Don't skip this step! While the dough is in the refrigerator spread the walnuts on a baking sheet. Bake for 10 minutes to toast. Remove from oven and set aside to cool. Lightly spray your temp-tations pizza stone with non-stick spray. Press down chilled dough onto the stone to form a large flat circle, leaving a 2-inch space between the edge of the crust and the edge of the stone. Bake for 20 minutes or until lightly brown. Cool completely before adding the topping. For the topping place the cream cheese and butter in the bowl of a stand mixer. Beat on high for 2 minutes or until fluffy. Blend in powdered sugar, vanilla and 1/4 cup of caramel sauce. Spread all over cooled crust. 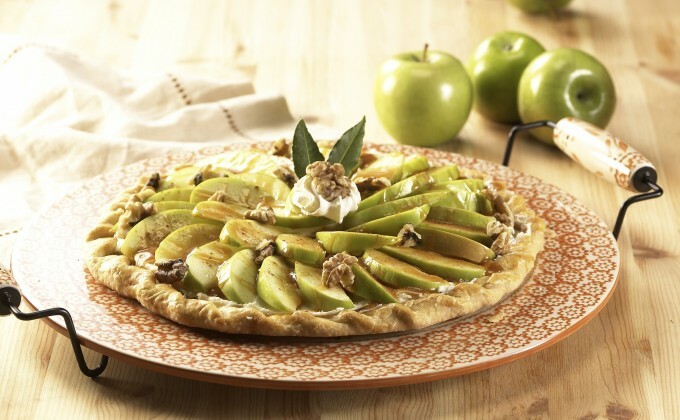 Arrange apple slices in a circle pattern on top. Drizzle with remaining caramel sauce and toasted walnuts. Slice and serve or refrigerate for up to 3 days.